I am sitting in the Angel Hotel, Helston. Suffice to say, that, had I been guessing, I wouldn’t have come up with that name. Nevertheless, today was pretty good. I had an excellent breakfast, and only had to repack my rucksack twice as I remembered various important items such as ibuprofen and ball-of-the-foot pads were at the bottom. I left around 8.20 and made good time to Porthoustock, and then Coverack, where I should have reached yesterday. The first bit was easy, and, had there been a possibility of accommodation at Porthoustock, I would have gone that far, but I am glad I didn’t attempt Coverack yesterday. Despite yesterday evening having been bright and sunny, it was mizzling again this morning and everything was slippery. The terrain was easier than the first couple of days, although the path hugged the cliffs, and when the cloud lifted, I had some good views. There weren’t so many steep ups and downs, but my average pace was still only just 2 miles per hour. I met various walkers coming toward me, but no-one going my way – suggesting I am neither slower nor faster than most people. The coast had some interesting rock formations, including an archway. 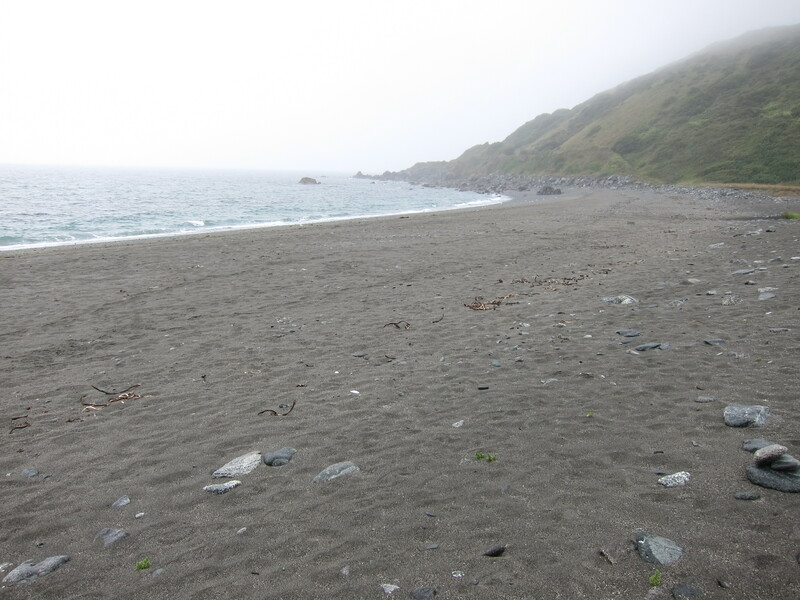 I reached Kennack Sands, a lovely silvery beach around 2.30 and had a very satisfactory Cornish pasty from the café. Much of this area of coast is National Trust land, and I was delighted to discover that the path is managed in this area for glow-worms. Apparently, they like long cover, so the grass is not cut back. 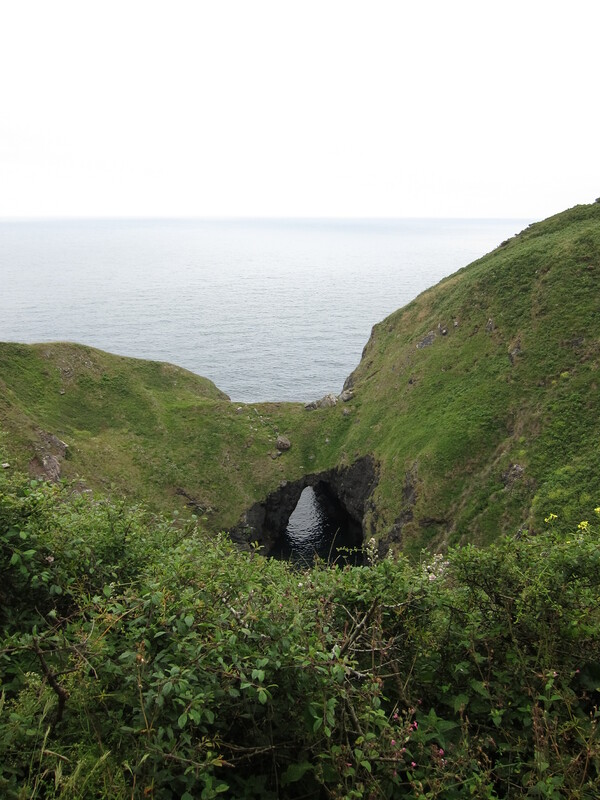 I was in two minds as to whether to press on all the way to the Lizard, or stop at the previous cove. In the event I did continue and by then I seem to have got more into my usual stride. I covered 16 miles by 5pm, into the little settlement above the Lizard, just to see the bus to Helston sailing past me. A rather tedious wait at the bus stop, then a white-knuckle ride through very narrow lanes, at top speed, I was sitting upstairs front and frequently had the urge to duck as we slammed into overhanging branches. I had high hopes for Helston. It is the town that Mary Yelland comes from in Jamaica Inn and longs to return to, comparing its gentle greenness to the bleakness of Dartmoor. I guess it’s changed a bit since her day! 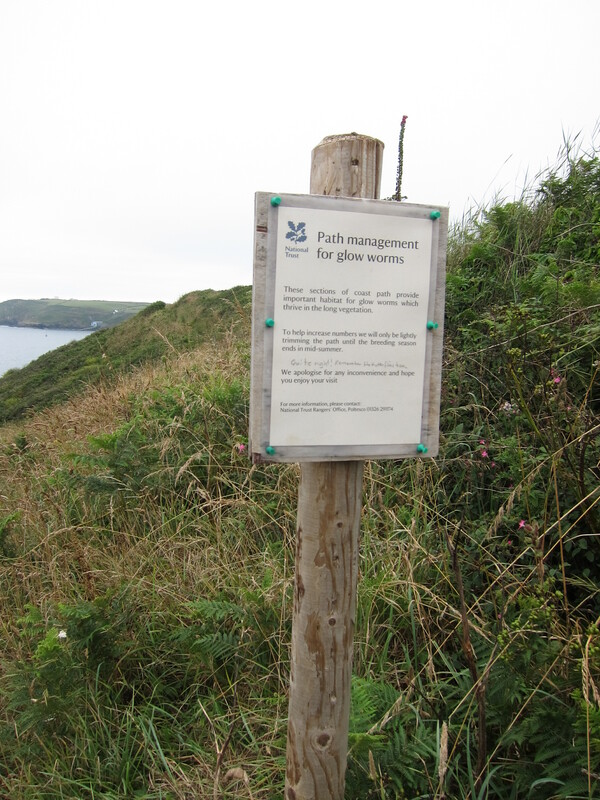 This entry was posted in Cornwall and tagged Cornwall, Glow-worms. Bookmark the permalink.